Everybody wants their real estate blogging to bring traffic to their site, great rankings and high conversions. 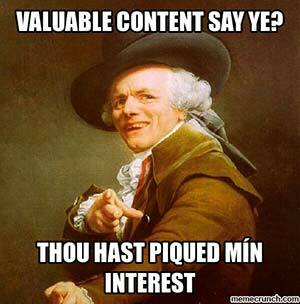 What many agents do not understand is how to properly use content marketing that will achieve this aim. In the following article, we'll be going over the "dos and dont's" of basic blogging concepts. This may come as a surprise to you, but the first thing to know is... don't blog your listings. This is by far the #1 mistake agents make when beginning a real estate blog - and it's understandable. The vast majority of your marketing efforts do revolve around your listings being highly visible on the web. In the unique case of a blog, however, featured listings can act as a deterrent to a higher overall viewership of your blog in general. The question then becomes, if we do not recommend blogging your listings for sale, why? Listings have a temporary "shelf life" where they will go pending and then the page is no longer of any value. An individual listing as a topic has a very limited reach to your visitors. Anyone not actively looking for a home of that exact type is not going to view your article. If you are syndicating your posts to social media, you are training your friends/followers to ignore your posts. You should still regularly make blog updates as they are beneficial to search engine rankings. Your real estate blogging helps boost overall traffic levels from visitors, and increases lead generating activity in other areas of your site. If you're looking for more information, the following two links go into greater detail about the need for good original content on your site updated regularly. Search engines love regularly posted original written content. ...To attract and build a viewing audience who returns to your site to see topics of interest to them. This is about building brand awareness, expertise in your niche market, and providing "entertainment" to solidify your brand offering in their minds. Think of any commercial you have watched - and it's instantly obvious that targeting the lifestyle, choices, interests, hobbies, and local community events that are of interest to your target market are a way to "tie" in your brand and service offerings to end users. Recommended topics will vary by location and real estate agent - but it's crucial that you determine some underlying characteristics of your most common transactions. For example, if your business is primarily with lakeshore owners, your blog should include community oriented topics relating to the lake, real estate tips and ideas for lakeshore living, local events on the water, tricks for improving your lakeshore home etc. The point is that these posts are going out to your social media to be shared and viewed by others. Attracting traffic to your blog will involve blogging about topics that your followers en-mass will want to click on to read. Some of the most prolific and successful real estate bloggers I've ever seen write about their favorite socks, the Christmas tree lighting downtown, and ways to ensure your pool stays clean. In this Inman news article, you'll find that real estate as an industry has the lowest engagement rate online of any industry category. Agents post more frequently, with fewer results than literally any other online marketer. You aren't just targeting current buyers and sellers. You are cultivating awareness and credibility with future buyers and sellers. A good blog post can have years worth of value online and 1000's of visits from potential clients. "But writing is hard! I don't have the time." Indeed, it can feel like there's no time in the day to also be a real estate blogger. While good blog posts are a big part of an overall success story for any real estate website, you do need to consider where your time is best invested. That is almost always in lead curation and closing escrows. To overcome this challenge, many agents, offices, and teams find that "offloading" this effort to low cost providers. This is an excellent way to boost productivity and focus where it needs to be while ensuring that the value of your site continues to increase over time. Upwork is a merging of the former oDesk and Elance. This merging of both communities means that there is a very large pool of freelancers here to choose from, giving you lots of options. The sheer number of candidates may be overwhelming. This is why I recommend conducting a search and inviting candidates rather than letting them apply. Using Upwork you may consider searching for the terms "writer" and "real estate" in conjunction. This will best define your targets. Gain access to thousands of pre-screened, expert writers. Scripted offers different one-time-fee packages for a wide variety of writing purposes. They do everything from blogs to social media posts. This is a community of "liberated" writers, editors, translators and content strategists... At your disposal and ready for contracts based on your specific needs. You may also consider hiring a virtual assistant to help manage posts of new blog entries to your site, or ordering of new blog posts from these writing companies. Don't forget your time is valuable - and you need to be spending it closing transactions and fielding new leads, not becoming a professional journalist in your evening hours. There are many services for this, but our favorite has always been Fancy Hands. You can also choose to look for a local writer. Make Real Estate Articles Fun... You're the Expert! Whenever you are blogging a topic or article, remember that you as an agent in your area have a wealth of useful knowledge that you are taking for granted. All those years learning the intricacies of escrows, REOs, inspections, disclosures, HOA's, etc are ripe for the picking when it comes to being able to educate and interest your customers with your knowledge. In the same way that sitting down with a new client begins with "small talk", let your personality, shared interests, and charm shine through in your writing. You are building a relationship, and that requires helping your client believe in you. Good luck and happy real estate blogging! Also, if you've used or are going to use some of this information in your strategy let us know in the comments. I'm interested to hear about your results.